Mix It Up Hawaii! was online live at the Sheraton Waikiki on October 15, 2010 from 8:00am to 5:00pm. 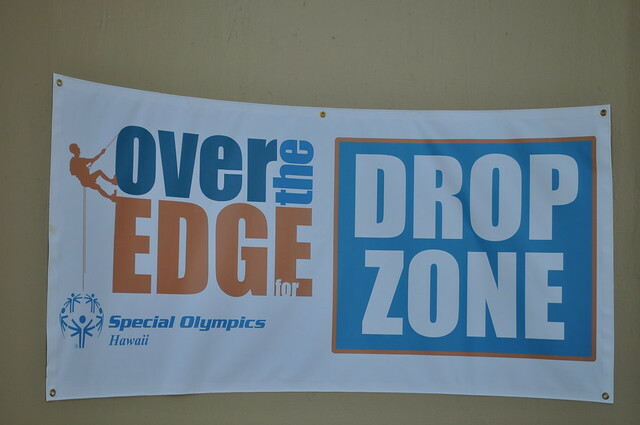 We were with @neenz, @tweetpea, @nctrnlbst and Nona talking to the participants in the Over the Edge Fundraiser for Special Olympics (@SOHawaii) right after they went over the edge! I am sitting here with bated breath and lump in throat to see all you brave souls go over the edge. Our hearts and prayers are with each and every one of you and a heartfelt Thank You for your daring efforts on behalf of Special Olympics Hawaii. This is a message for our daughter-in-law Adirenne son Chad Laurion who are going over the edge around 2:30 or so. Best of luck and if anything happens we will take the grandchildren! Hahahah just a joke go getem. Also thanks for all you do for Special Olympics Maui and the other Islands you serve Adrienne. Jerm and Karin Good Luck! Wish we were there and going with you! This is awesome! Cudos to all the brave men and women who went ‘over the edge’ for Special Olympics today, especially my guy, Steve Hill, and his daughter, Cris Galvez, who honored the memory of his late son, her late brother, Steven Hill. God bless you all. Hello! thanks so much for putting up these videos. I think though that there are two copies of the 8-1115 and no 1115-1230 which is when i went down! any chance you could fix it? Sorry about that Leah, it is fixed now. Hopefully you’re in the segment. When doing live video and recording straight to the remote server it is always hit or miss. Thank you for your support of Special Olympics! Hope you had a great time!